Given recent financial crises and scandals, the rise of corporate social responsibility and the challenge of environmental sustainability, few would disagree that the role of ethics has taken centre stage in the management of organizations. In reality, however, organizations have found it extremely difficult to promote successful, ethical behaviour as this rarely results in short-term gains which can be appraised and rewarded. By and Burnes bring together leading international scholars in the fields of organizational change and leadership to explore and understand the context, theory and successful promotion of ethical behaviour in organizations. By focusing on real world examples, contributors analyze the issues and challenges that hinder ethical change leadership which can lead to sustainable organizations. This unique volume brings together the worlds of organizational change, leadership, business ethics and corporate social responsibility, resulting in a book that will be valuable reading in all four fields. 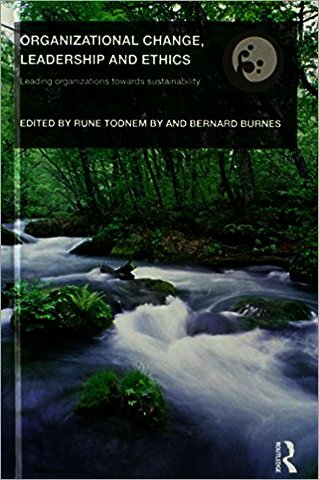 With contributions from leading scholars, including David Boje, Dexter Dunphy, Suzanne Benn and Carl Rhodes, Organizational Change, Leadership and Ethics is a must-read.